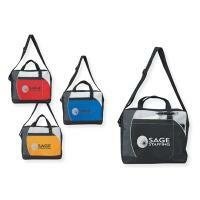 With your firm imprint or logo, our promotional briefcases, make great promotional items. 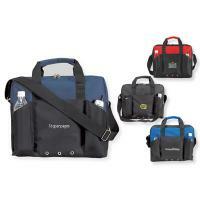 See our wide choice of briefcases below. 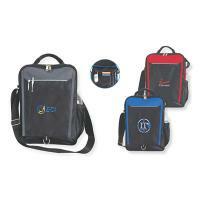 These items will make a big impression to promote your business by advertising with promotional products.. This means that everyone will see the briefcases with your company imprint or logo, use them, and think of your firm when they need your product or business. It is also a great way to promote a specific event. 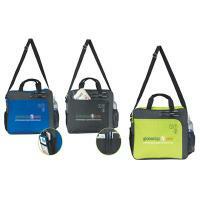 Lowest price starting at: $43.49 each. 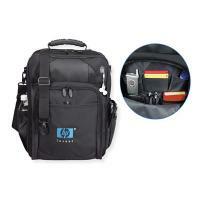 Description: Three separate compartments - front zippered area with pockets for pens, pencils, business cards, etc., main compartment with pockets for computer cords, modem, MP3 player and separate back compartment for a laptop with extra-thick padding, zips across top and down one side for easy removal of laptop and lined with nysoft fabric, padded and zippered cell phone pocket, water bottle pocket, porthole for earphones, slip pocket on back slides over roller bag handle, adjustable and detachable shoulder strap with padded shoulder grip, padded backpack straps. Size: 13 1/4" x 16 1/2" x 7". *There is a 8 % surcharge on the price of this calendar if it is shipped to California, Tennessee, or Maryland, so the price per calendar shipped to these states will be 8 % more than you see on the website. This surcharge will not be reflected on the order form, but will added to your total and charged on your credit card. Lowest price starting at: $6.30 each. Description: Front flap closure with matte metal pull and Velcro, slip pocket on flap, organizer pockets under flap, zippered opening on top and sides, elastic side pocket for water bottle or cell phone, adjustable shoulder strap and single carrying handle on top. Size: 11" x 14" x 4". *There is a 8 % surcharge on the price of this calendar if it is shipped to California, Tennessee, or Maryland, so the price per calendar shipped to these states will be 8 % more than you see on the website. This surcharge will not be reflected on the order form, but will added to your total and charged on your credit card. Lowest price starting at: $15.75 each. Description: Messenger bag or cross-body backpack, organizer pocket under flap, padded laptop pocket on back, porthole for MP3 player, swivel quick-release for dual use. Size: 18" x 12" x 5 1/2". *There is a 8 % surcharge on the price of this calendar if it is shipped to California, Tennessee, or Maryland, so the price per calendar shipped to these states will be 8 % more than you see on the website. This surcharge will not be reflected on the order form, but will added to your total and charged on your credit card. Description: Dual gusseted pockets on front for phone and water bottle, front pocket with inside organizer pockets, adjustable shoulder strap, fabric wrapped handle grips. Size: 16" x 12" x 4". *There is a 8 % surcharge on the price of this calendar if it is shipped to California, Tennessee, or Maryland, so the price per calendar shipped to these states will be 8 % more than you see on the website. This surcharge will not be reflected on the order form, but will added to your total and charged on your credit card. Lowest price starting at: $4.94 each. 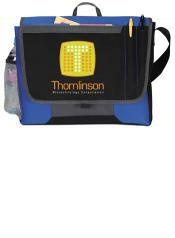 Description: Features: * Front slip pocket * Two pen pockets * Front flap with hook and loop closure * Mesh water bottle pocket * Carrying handle * Shoulder Strap Material: 600 Denier Poly Canvas Size: 14" x 11" x 3 1/2" *There is a 8 % surcharge on the price of this calendar if it is shipped to California, Tennessee, or Maryland, so the price per calendar shipped to these states will be 8 % more than you see on the website. This surcharge will not be reflected on the order form, but will added to your total and charged on your credit card. Lowest price starting at: $7.88 each. 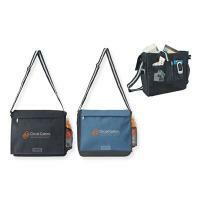 Description: Front slip pocket with screen print detail in upper right corner, organizer panel, multi medium side pocket, business card pocket, zippered closure on main compartment, two pen holders, mesh water bottle pocket, adjustable shoulder strap. Size: 14 1/2" x 12" x 4". *There is a 8 % surcharge on the price of this calendar if it is shipped to California, Tennessee, or Maryland, so the price per calendar shipped to these states will be 8 % more than you see on the website. This surcharge will not be reflected on the order form, but will added to your total and charged on your credit card. Lowest price starting at: $5.42 each. 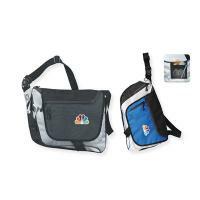 Description: Front slip pocket, zippered closure on main compartment, cell phone pocket, two pen holders, adjustable shoulder strap, carrying handles, contrasting stitch detail. Size: 16" x 11 3/4" x 4". 600D Polyester *There is a 8 % surcharge on the price of this calendar if it is shipped to California, Tennessee, or Maryland, so the price per calendar shipped to these states will be 8 % more than you see on the website. This surcharge will not be reflected on the order form, but will added to your total and charged on your credit card. Lowest price starting at: $8.78 each. Description: Zippered front flap pocket, Velcro closure on flap and main compartment, organizer panel, mesh water bottle pocket, adjustable shoulder strap with custom webbing, boarded bottom, contrasting stitch detail. Size: 14 1/2" x 12" x 5". *There is a 8 % surcharge on the price of this calendar if it is shipped to California, Tennessee, or Maryland, so the price per calendar shipped to these states will be 8 % more than you see on the website. This surcharge will not be reflected on the order form, but will added to your total and charged on your credit card.